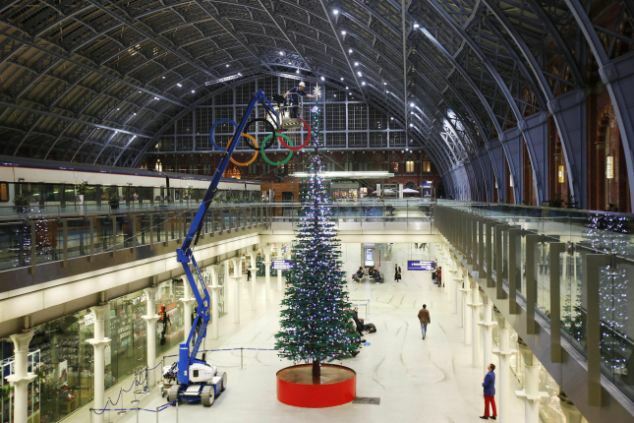 David Buxbaum, marketing director at Lego told Toy News: ‘The Lego brand is all about play and creativity and Christmas is the time for celebration and fun. 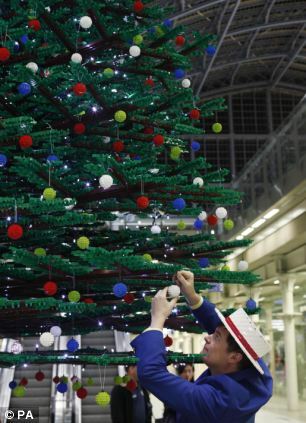 This magnificent Christmas tree is a shining example of these values and shows that with Lego bricks you can let your imagination run wild and build anything. Its been kind of a crazy last few days for me with Thanksgiving, Black Friday, and family — hence the non-posting. So when I saw this picture by pixbymaia my mind went immediately to “Manic Monday” which is about how I feel about all the work I’ve got to do that I’ve been ignoring the last few days. What I think is interesting is the fact that in 1986 when this album was originally released there were only two girl hairstyles — the classic pigtails or the “female” hair — and there was only the classic grin face. There’s still a couple days till Thanksgiving, but with Christmas just around the corner Holiday MOCs are starting to appear. This model by SPARKART! is so full of win! 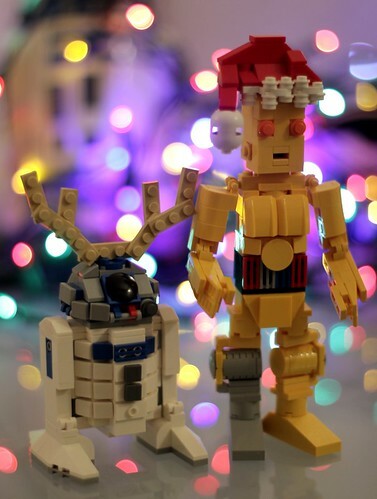 The santa hat and antlers are adorable on R2 and C3-PO and the sparkly lights in the background set everything off. 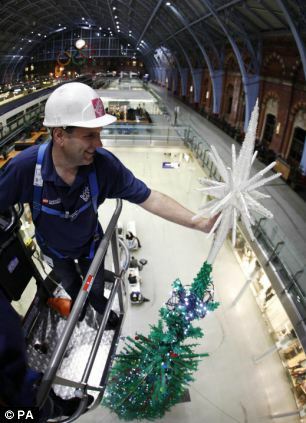 Sometimes a LEGO model isn’t big or complex. It’s just a hand full of parts assembled in a clever way. 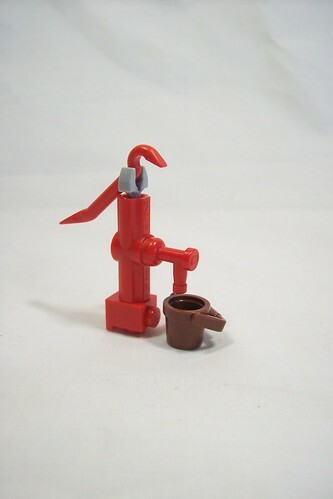 This water pump created by legomocs.’s is a great example of this. With only 8 parts (10 if you count the bucket) the pump is accurate and yet so simple. 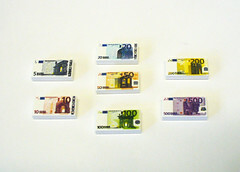 Tobias was kind enough to send me a sample both the US and Euro currency with 7 different types of banknotes. 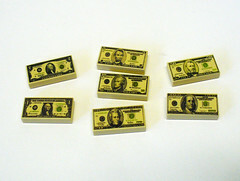 They are very reasonably priced on TASTER BRICKS bricklink shop starting at a little under $3 for a single set, $13 for 5 sets, and $23 for 10 sets (prices vary slightly depending on exchange rate). I absolutely love them! 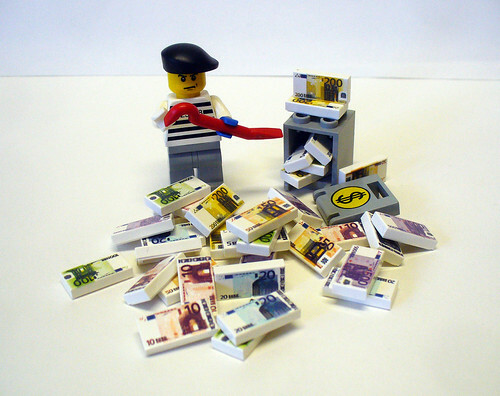 Much better and way more fun than official LEGO money. As you can see from the pictures, I couldn’t help but have my own fun with the tiles. I certainly recommend them for anyone who wants to make their town scenes more realistic. On my recent trip to Walmart a small display in the jewelry and watches area caught my eye. I saw LEGO watches but they were different from any I’ve ever seen. There were two notable differences — 1. The packaging was thinner. 2. There is this a small minifig on the band of the watch. The price is around $16 US and from what I saw there were 5 different designs (I didn’t take a picture of the Darth Maul one). You’ve seen me talk about the Giant Yoda that has be built countless times before, but there’s a new Yoda in town. Well, San Francisco at least. 😀 If you live near by you too can help build him. What: Three-day community build where families will help LEGO® Master Builders to create a 12-foot tall by 10-foot wide LEGO® Star Wars™ Santa Yoda made entirely of LEGO® bricks to kick-off a countdown to the holidays found at http://www.legosantayoda.com. 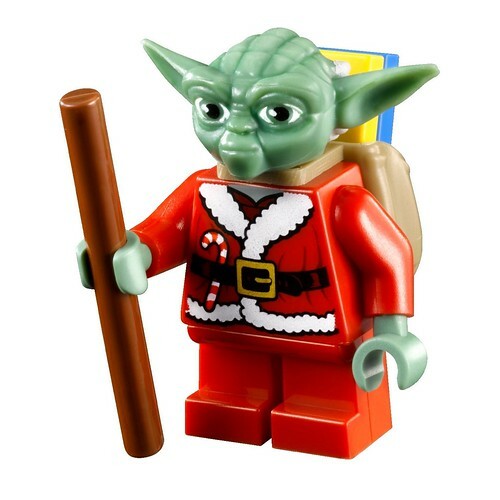 Children and parents will be invited to build a portion of Santa Yoda which LEGO® Master Builders will then add to the larger than life model. Where: Union Square (next to the seasonal ice skating rink), San Francisco. This is in conjunction with a holiday donation campaign benefiting Toys for Tots. For those of us that are too far away there will be a mini site legosantayoda.com (not yet up) covering the event. As I learn more about this event I will let you know. A ground-breaking interactive window that gives children the opportunity to star in a game as a LEGO® Minifigure will be unveiled at the LEGO Group’s brand retail store at Water Tower Place in Chicago, Illinois on Tuesday, November 15. 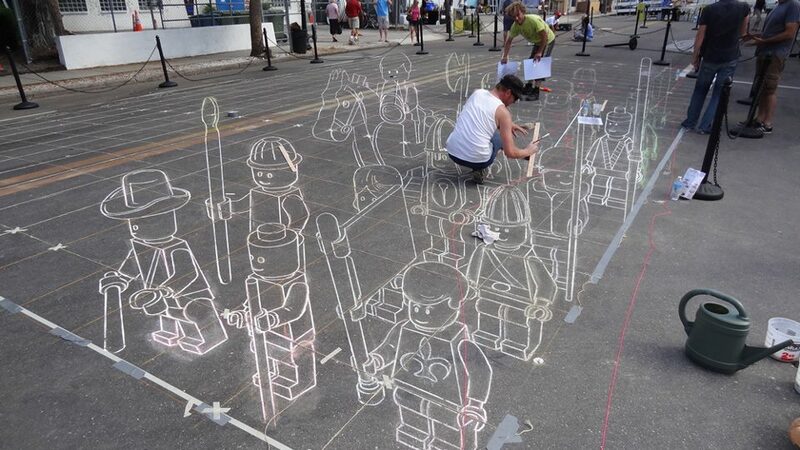 Children visiting the store window will be able to watch as they are magically changed into a LEGO Minifigure. The hungry LEGO Dragon Brickley then pops out from the side of the window and encourages the children to feed it with virtual apples lying on the ground. The interactive shop window uses a motion-sensing camera to ‘see’ the child standing in front of the shop. This information is processed by specially developed software and a powerful Intel® CoreTM i7 processor to convert the child’s motions into a LEGO Minifigure that is then projected on to a thin film screen applied to the back of the window. The child can then control the Minifigure’s actions by moving arms and legs in a similar way to motion-sensitive controls use in console games. The window is a further development of the thinking behind the popular augmented reality Digital Box that is in all LEGO brand retail stores. The aim of the interactive window and the Digital Box is to bring the LEGO brand experience to life in a new, exciting and immersive way. The Digital Box allows customers to see what is in selected LEGO sets using a camera and a screen. When the customer holds a set up to the Digital Box’s camera, a 3D animation of the contents is shown on the screen, superimposed on top of the set. The installation in the Chicago store is a pilot that will be used to gather information about the interactive window. No decision has been taken about putting the window into other stores. The window has been developed by LEGO Digital Business in collaboration with Danish production company GreatHouse and with hardware powered by the Intel® Core™ i7 processor. This sounds interesting, and I imagine it is fun for the kiddies. Hopefully there will be a video actually showing what this is all about soon. Although the press release says that there are no plans to put it anywhere else, my guess is that just like the Digital Box it will be in other stores eventually. Probably the Imagination Centers like the Disney LEGO Stores or the Mall of America LEGO Store. 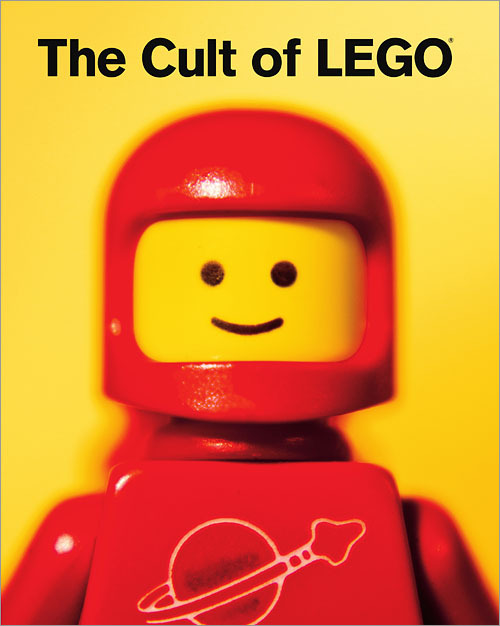 Joe Meno and the wonderful people at No Starch Press were kind enough to provide me with a copy of Joe Meno and John Baichtal’s new book The Cult of LEGO. I received the book a little over a week ago, but up until tonight I didn’t have the time to actually read through the book, so although its a little late (literally and figuratively) here’s my review. This book starts naturally with the history of the brick. Even though the book is 304 pages long, it almost read like a Reader’s Digest with short sections briefly covering each topic. That’s not necessarily a bad thing, as it continues to engage the reader. I read through a good half of the book and skimmed over all of it in two hours. 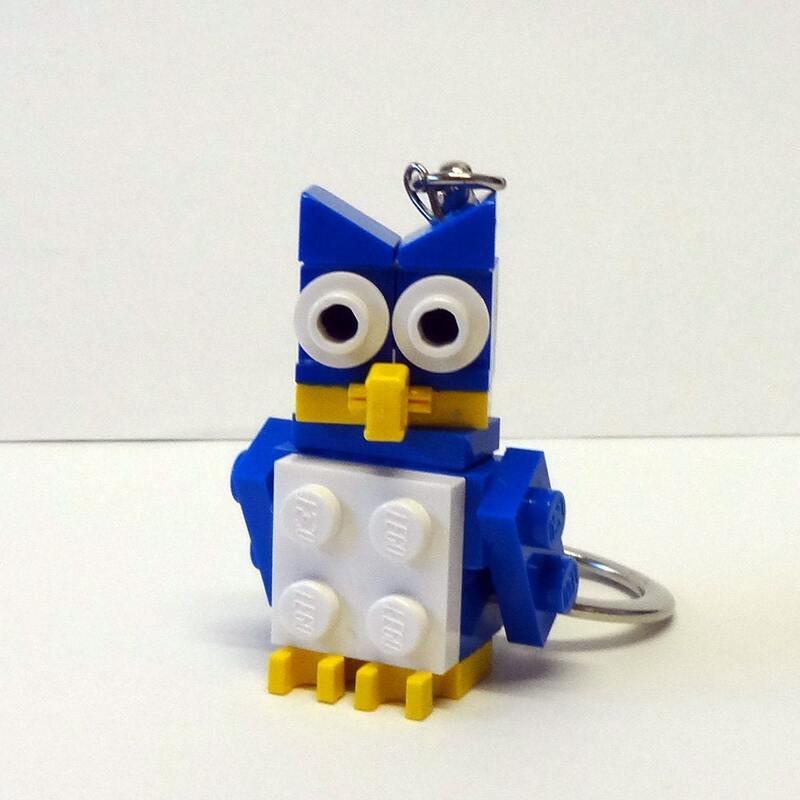 There are chapters on everything from minifigs and LEGO conventions to Mindstorms and LEGO Art. Pages and pages of pictures fill the book and it is beautifully bound. 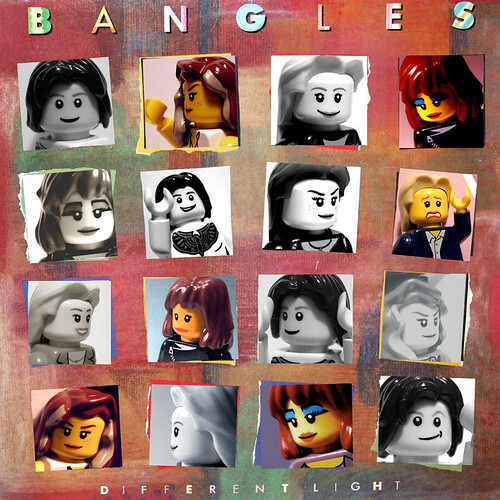 It is certainly a wonderful addition to any LEGO fan’s library as well as a way to show your non-LEGO friends that you are not alone in your obsession. Like Bender’s book much of what was in this one was familiar to me. There were many familiar names and faces of my fellow LEGO friends. One of my few complaints is that there seemed to be heavy emphasis on some builders while other just as notable (if not more so) builders were completely missing from the pages. This may or may not have been intentional as you can’t focus on every great builder. 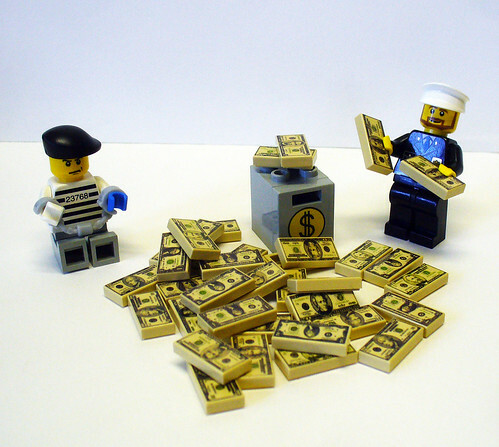 What I do like about The Cult of LEGO is that it is yet another step to bring the LEGO hobby into the mainstream. It naturally talks about the “Dark Ages” (the years a person stops playing with LEGO) that many AFOLs went through in their teens or twenties. Most of us didn’t know there were other LEGO fans out there when we were kids. We didn’t have First LEGO League, LEGO Cons, or online forums to share our passion with so many stopped when they thought they were too old or that playing with a kid’s toy wasn’t “cool.” I never had a Dark Age, but I’m the exception not the rule. Hopefully with books like this and all the outlets that are now available LEGO can be seen as a legitimate hobby. Its made the rounds on several blogs and Facebook especially. 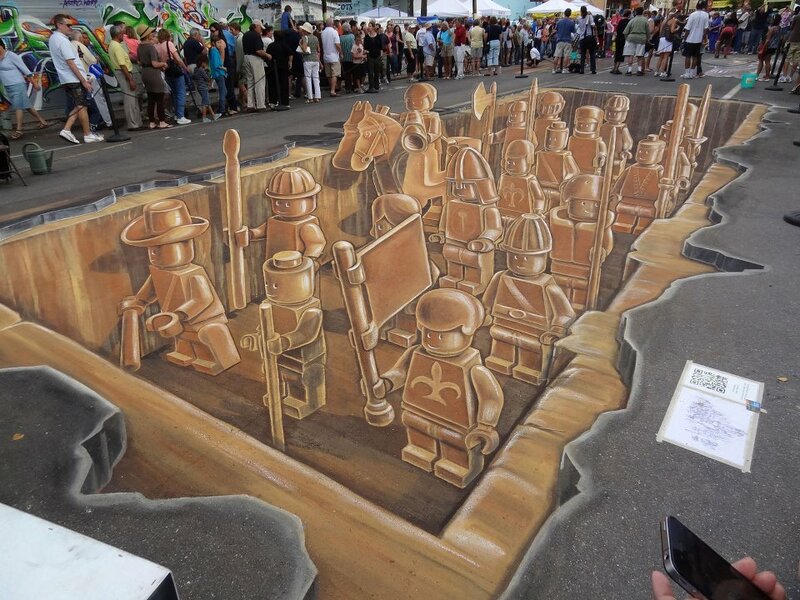 The artist Leon Keer created his LEGO Terra Cotta Army at the chalk festival in Sarasota, Florida this weekend. 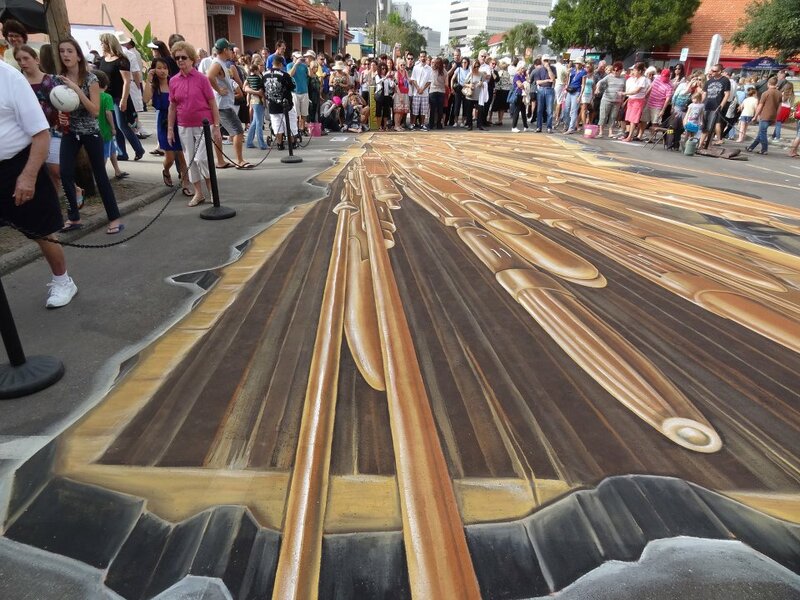 I was certainly impressed from the moment I saw the outline drawings. Click the pictures to check out the French blog I found these pictures on.